"Writing offline" seems almost an odd phrase today. You'll find it—online—in Words Unwired, a commentary by Lorin Stein in the New York Times Sunday Book Review. 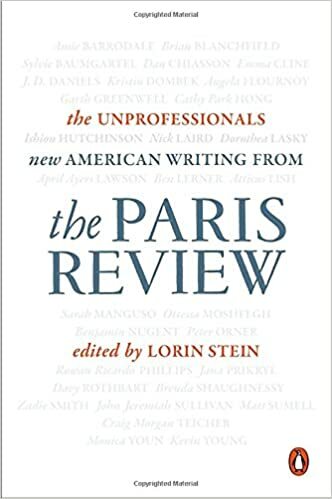 We understand, of course, when he gets to the even odder term, "unprofessional," that Stein, The Paris Review editor, is writing in support of the book he has edited, The Unprofessionals: New American Writing From the Paris Review. "Unprofessional" seems an unfortunate choice of eye-catching title terms. But whether it strikes you as austerely chic or just needlessly derogatory, "unprofessional" in the way Stein uses it, refers to "writers...whose private worlds come first." He's working with an interesting concept of "public solitude." That's something experienced and/or evinced by many actors trained in the ways of "method" acting—sometimes over-attributed to Konstantin Stanislavsky. As Stein puts it, it's "the ability to be alone onstage. Really, to be alone, without wondering how you look to the audience." Sometimes called "internal' as opposed to "external" technique, the issue brings back memories of raging debates in the last century's acting communities. Back in the day, the baffling part of this was that some of the era's greatest actors were "external" in their approach—theoretically "merely acting," not at all immersed in their imaginary worlds as Uta Hagen might have wished they were. So the question was bedeviled by uncertainty. Awareness, you see, was the elusive thing. At the moment of a good performance, how aware was the actor of the audience, of the script's constraints, of the director standing with the stage manager in the right wing, and of the price tag dangling off the costume sweater of one's co-star? It's still awareness. And doesn't Stein quibble, Sybil? To write a story also requires public solitude. You can’t be worrying how you sound. You can’t wonder whether you or your characters are likable or smart or interesting. You have to be inside the scene—the tactile world of tables and chairs and sunlight—attending to your characters, people who exist for you in nonvirtual reality. This takes weird brain chemistry. (A surprising number of novelists hear voice, and not metaphorically. They hear voice in their heads.) It also takes years of reading—solitary reading. Eleanora Duse was our goddess of the internal. Sarah Bernhardt our icon of the external. How we argued. And then we went out onstage and did the show. Eight times a week. Digitisation means many things, but because it's an energy of distribution, at the end of the day it means getting out onstage and doing the show. Eight times a week. And if Emily Dickinson had been on Twitter, would she have pulled off a single poem before Death kindly stopped for her? It might have been a lot harder. The demands of various social media—integral elements of many contemporary authors' and publishers' and agents' marketing array—do draw, at least at times, on some of the creative impulse that lies close to the most private core of a good artist's voice(s). But is it right, then, to try to partition things so firmly as Stein does? Writing fiction is pretty much the opposite of writing a good tweet, or curating an Instagram feed. It’s the opposite of the personal-­­­slash-professional writing that is now part of our everyday lives. More than ever, we need writers who are unprofessional, whose private worlds come first. Let's set aside that term "unprofessional." It's the buzzword in Stein's sales lexicon and we understand this, because we're all marketing moderns, right? By writing offline, literally and metaphorically, this new generation of writers gives us the intimacy, the assurance of their solitude. They let us read the word “I” and feel that it’s not attached to a product. They let us read an essay, or a stanza, and feel the silence around it—the actual, physical stillness of a body when it’s deep in thought. It can’t be faked, in life or on the page. We see the opposite all around us every day, but to me, that kind of writing matters now more than ever before—precisely because it’s become so hard to do. We must respect the beauty of the image Stein has conjured here. "The actual stillness of a body when it's deep in thought"—no contest, this can surely be one of the most compelling glimpses of the human context. But to what kind of arrested development of craft and career do we assign our authors if we require them to lock their creativity into Dickinson's bedroom? Is "writing offline" truly a criterion we want to champion? Some of the authors I honour most are intensely world-aware, whether they leave the door open or close it when they write. How can we presume to tell them that their business—or place of business—is "offline"? Here's what happened: As with so many debates in the author corps today, the acting community of the last century was noisy with factions. One was expected to take sides, announce one's affiliations, swear allegiance to the kitchen sink or be eternally damned to wearing tap shoes for tired businessmen. But most of us finally decided it was none of our business how Sir Laurence did it. And with nothing but respect for Stein and the Review and the collection, handsomely published by Penguin, I want to say to our authors that neither Porter Anderson nor Lorin Stein knows the best way to go about producing the material you need to write. My own ideal sides with those I would classify as professionals, not Stein's brand of "unprofessionals." I'm interested in people who can still hear a playbill fall in the third row while being stabbed by Iago and in people who have not forgotten that above all in publishing today, we need readers. Somewhere, I think there are literary professionals writing right now with the lines wide open. They thrive in the blast. They feed on the bombardment of data, they love the glow of the instrument panel, they know themselves, and deeply, as creatures of the ether. I don't want them to feel that we're less receptive to what they might produce than we are to work from those who hunker down in fond isolation. If Stein and the Review want to cordon off those who are "writing offline, literally and metaphorically," I'll be happier to welcome the best work however and wherever it's produced. And the more authors I see who can find the force of their long-form genius in the razor-teeth of the tweet storm, the more hope I have for the best literature of our digital age.